From entry level vinyl cutters to professional large production sign vinyl cutters and plotters at incredible prices with outstanding support. 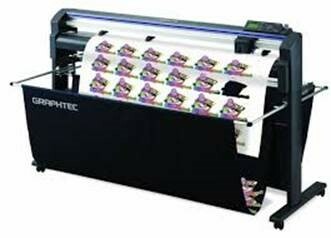 We carry all brands but focus on the best selling Graphtec brand of vinyl cutting plotters. The Graphtec vinyl cutting plotters are the easiest to use and the most accurate vinyl cutters and plotters on the market. Graphtec vinyl cutters and plotters are compatible with every make and model of printer on the market today and by separating this application you will free up your printer for more print jobs thus creating more profit. Graphtec Vinyl Cutting Plotters VINYL CUTTERS • ROLLFEED-FLATBED-DESKTOP CUTTING PLOTTERS DIGITAL FLATBED-ROLLFEED-DESKTOP CUTTERS • DATA LOGGERS “RELIABILITY, DURABILITY AND PERFORMANCE” ARE THE PILLARS THAT DRIVE THE QUALITY OF GRAPHTEC CUTTERS & DATALOGGERS. IT’S A PROMISE WE KEEP WITH EVERY MACHINE WE MAKE For more than 69 years, Graphtec has been on the leading edge of cutting & measuring solutions. We were one of the first to execute cutting technology in our vinyl cutters, and our machines are famous all over the world for their legendary durability. Graphtec proudly acknowledges its standing as a world leader in cutting and measuring device technology and is committed to further enhancing its competitive strengths, product features, performance, and drive for excellence.